I’ve never been much of a cook. I’ll just admit it. Before I met Andy, I mostly ate white minute rice for dinner every night. It’s like cooking because I had to boil water… Right? The thought of having to wait more than five minutes for dinner was just unacceptable to me. I mean, I’m hungry right now, not an hour from now! Well, minute rice isn’t going to cut it when there’s two of us to feed. Andy is definitely the cook between us, but I’m having a good time learning my way around the kitchen, learning how to use knives, and learning to really enjoy trying new recipes. Who knew I would start to kind of like cooking?! 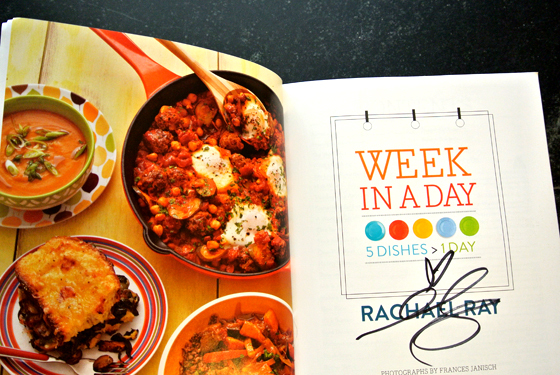 Last weekend we had an opportunity to see Rachael Ray in person while she promoted her new cookbook “Week in a Day.” It was so much fun! She’s funny and personable and had a lot of interesting things to say about cooking and eating that I found inspiring. 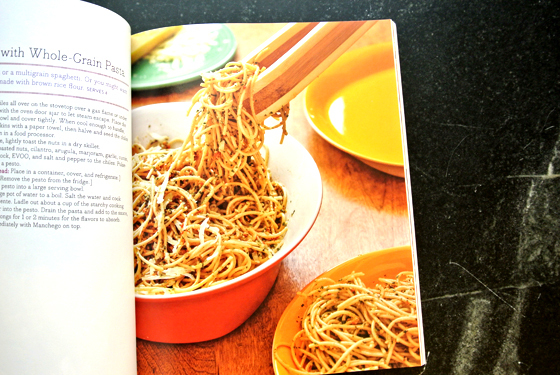 We also received a copy of her cookbook that I’ve been really enjoying looking through. 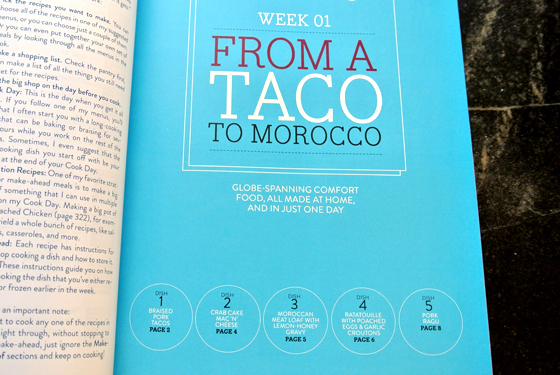 The concept of the book is that you make a bunch of meals on Sunday that you can reheat and add fresh ingredients to throughout the week. A lot of it is focused around interesting ways to use leftovers and ways to use the same ingredients differently. I love the concept. I think it’s really relevant to modern busy schedules as well as tight budgets. This book has 43 weeks of meals. She said she doesn’t really expect you to make five meals at one time (that’s a lot! ), but two or three is a great start to the week and a great way to eliminate the stress of that daily “what the heck are we going to eat tonight?” conversation. I love that Rachael includes lots of meatless recipes, like this vegetarian Mexican-style pesto with whole-grain pasta that looks delicious (page 68). I hardly eat any meat (just fish), so it’s always hard for us to find recipes that sound good to both of us. This recipe for garden-style straw & hay pasta with bagna cauda had me trying to talk Andy into trying anchovies (page 151). It just looks THAT good! It’s not all pasta recipes, promise, but those are some of my faves. Plus it’s Rachael, so of course there’s a lot of Italian influence. 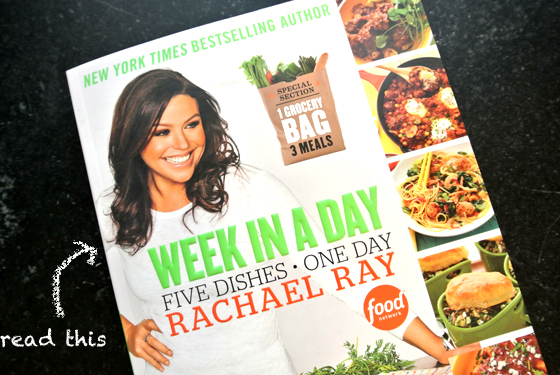 I’m looking forward to trying some of Rachael Ray’s “Week in a Day” recipes for myself soon. What about you? 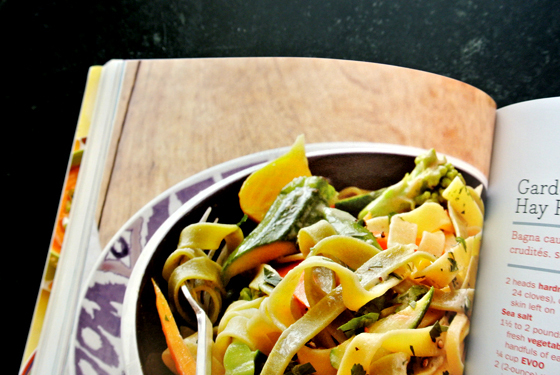 Do you have a favorite cookbook? I’d love to check out some other ones!